Everywhere I go people are lamenting these crazy times—earthquakes, tsunamis, revolts, wars, financial meltdowns—you name it, everything seems haywire. And, just as we seem to settle down from one fiasco, another one flares. I don’t know what your take is on it, but this is mine. You know those times in life when you just don’t seem to get the message? When you have to get knocked aside the head to pay attention? I think this is one of those times. Just like those times when life has gotten too stressful and I get sick to force me rest. Or, when we ignore financial warning signs until overdraft notices come or credit cards won’t work. I think Mother Nature, our financial system and world politics have had enough. They are telling us over and over—pay attention. And, every time we don’t listen, the message comes again—only this time bigger, louder and scarier. World politics are asking us to deeply consider our differences; the differences that add to the vibrant tapestry of our world. Can these differences be honored rather than tolerated? Can they be used to bring us together rather than tear us apart? In other words, how do we move toward world peace—a tall order! And, what about our financial world? It’s time to put money in 2nd place where it belongs. We need money to support our hopes and dreams rather than lead the way. Money will never fulfill a life unless it is built from beliefs and values that sustain us—all of us. Enough for today. What’s your take on this craziness? As I was contemplating topics for this week’s blog, I really wanted it to be about the horrific earthquake in Japan. After all how could I turn a blind eye to the tragedy unfolding before us? I immediately thought about how disasters make us aware of how we are just one big family. And, how contributing $$ in any small amount can make a huge difference. But, it all seemed a bit trite. And, then I noticed, I hadn’t been getting the usual e-mails about how and where to contribute. Maybe I’m remembering wrong, but it seems the earthquake in Haiti garnered immediate requests for financial contributions to help the people regain some small semblance of their lives. We were ready and willing and knew that even $5 could make a difference. It made me wonder if we as Americans were harboring any resentments and consequently didn’t have the usual knee-jerk reaction to open our pocketbooks. And, was this resentment from World War II or for the booming Japanese economy that has drained away some of our financial growth and profits? Resentments so deep-seated that it takes something like this to bring them into the light to be healed. Maybe I’m just being cynical (not my usual suit) but it’s something to think about. Those resentments keep us locked up in negative thinking and from being who we really are. So, I was ecstatic this morning when I got an e-mail (actually a comment on an old blog) asking me to donate $10 to the Red Cross by text message. Gotta love this new twist on texting—painless, impulse charitable giving. It doesn’t get much better than that. I just did it, worked like a snap. Last week I heard someone use the phrase citizen beware while remarking that we had all become consumers. We’re used to hearing consumer beware of course, and it got me wondering what the connection is and what they had to do with money beliefs. The world seems crazy right now with citizen revolts all over the world: Tunisia, Egypt, Libya and even my home state Wisconsin. What’s going on? One thing is clear, most of it is about money. Citizens are revolting in the Mid-east against dictators who stripped government coffers while keeping their constituents in poverty. And government employees are battling to keep their right to collective bargaining and, consequently, power over their financial lives. Are these examples of the intersection between consumers and citizens? Perhaps. I think we can agree that we have become consumers; we’re told it’s the only way to keep our world growing and stable. But it’s that consumer mentality that pushed us into today’s financial mess. Is it possible that our consumer focus dimmed our role as citizens and eroded our rights? What rights am I talking about? There are many to be sure, but here are a few to consider: the right to a reasonable gap between those that have and those that have-not, the right to a balanced position in earning a living and providing employment, the right to access reasonable credit and to earn reasonable profits from providing credit. Is it possible that if we focus too much on being a consumer or servicing consumers, we too easily forget about the balance and acceptance that we owe each other as fellow citizens? Because without balance and acceptance, we will continue to head towards unrest – both financial and otherwise. After all, wasn’t sharing one of our earliest lessons? One for you, one for me. What do you think? There was a segment on the Today Show yesterday about the next big thing to fear. It seems that because of the economic downturn, we are all tired of counting pennies and we should beware of frugal fatigue. And, what’s more, 65% of us are already affected; one more reason to lock our doors and hide under our beds! All good advice but they left out the most important piece—give yourself a break! Living in fatigue (and fear) takes a toll on us. We need a breath of fresh air, a positive pat on the back and a few kind words. Take a break, give yourself a reward. A reward, you say, in times like this? How can I do that when I’m about to fall into the pit of doom? But wait—stop and think. What is fatigue? One definitions is: the temporary inability to respond to a situation as a result of overexposure or excessive activity. Wouldn’t it then make sense that the antidote for fatigue is rest? Rest from the activity causing the fatigue? So, yes, give yourself a break and reward yourself for a job well done. Give yourself a treat, whether it’s a movie, a night out or any small extravagance. That small respite from frugality will keep you focused on your long-term goals and able to respond consciously to the financial temptations we’re confronted with everyday. Because if you don’t take that break, all your previous frugality will be for naught and frugal fatigue will get you with unconscious overspending! Hmmmm, now what do I want for me—only me? I’m on vacation and resurrecting this blog from last year as a reminder to myself that tackling just the next step is always a good thing! At the beginning of a new year (and a new decade) I’m ready to plunge right in and make waves. Presented with the clean slate of a new year, I’m ready to march forward with plans to do things differently. I want to make changes with my money, my food, my family, my home, my work – you name it – it’s doomed for an extreme makeover! But then I found this old birthday card while cleaning out a drawer and it got me thinking about making waves. My waves are usually of the tsunami variety and can overwhelm me and everyone in its path. But does change in life have to happen like this? What if, instead of making waves, we dropped a pebble? Think of the ripples radiating from the single drop of that pebble. Unlike a wave, there is nothing destructive or invasive about them. Yet, change does happen – it just happens in small, gentle, balanced ways. If we applied this technique to our money problems, we would make one small gesture instead of vowing to change everything, everywhere. We would drink home coffee instead of Starbuck’s, buy store brand instead of name brand, make lunch one day a week or eat out one less time this week/month. Each, just a drop in the bucket of our spending habits but each starting a ripple that will make a difference. A small difference to be sure. But if we put aside that differen¢e and don’t lose the savings elsewhere, we’ll be amazed to see how it adds up. And, we’ll be amazed how change can happen effortlessly. How about giving it a try? I’m tossing the pebble. One small step for me…. Managing our money all comes down to choice. Do I buy this or that, use cash or credit, spend or save? Everyday we make countless choice about what to do with our money. Sometimes it can feel like financially we have no choices, but really it’s all up to us and those daily choices determine what our money life becomes. Unfortunately (as you’ve heard me say before) we don’t always make good choices because our beliefs and attitudes get in the way. Lately I’ve been pondering how my attitude changes when I think could instead of should. If I think I should save or I should cook tonight (instead of going out), I quickly pile on the blame and shame for not doing something right. I become the little child being told I should go to bed or I should clean my plate. It replaces my choices with demands and I become the rebellious child, stomping my foot and not dong what’s in my best interests. But if just swap a C for the SH, it changes everything. Suddenly I have a choice. I could save if I want to plan for that big vacation or I could spend it right now on a short-term pleasure. I’m empowered to stop and think – giving myself time to make the decision that supports me. My attitude shifts from rebellion against unwanted advice to cooperation with me and my goals. I’m brought right back to choice, my choice. Not the choices of my parents or my friends or my banker or financial gurus. But to my choice. I choose to make the decisions in my life instead of those eternal, internal messages telling me what I should do. Instead of unconsciously rebelling – I consciously choose. What a good thing! Not only for today – but more importantly – for tomorrow! In any event, the feeling was the same, no responsibilities, no deadlines, no structure. And, that’s how my first snow day this year felt. The second still felt pretty good—but when that third day filled with cancelled appointments, it became only about lost dollars, especially since they coincided with the biggest sales days in my husband’s campus bookstores. The dollar signs got even bigger. So when we dodged the big storm last week, I breathed a sigh of relief. It made me wonder if anyone had ever calculated the dollars lost due to a blizzard. With a quick search on the internet, I discovered that in 1996, figures quoted by the Salt Institute put the financial loss of a day of work to roadway conditions at between $4.8 billion and $5.6 billion. And that was 15 years ago! Hardly seems possible, but when I look at the financial havoc created in my little corner of the financial world, I can believe it. So, next time the forecast is for snow—as it is again this week—I’ll find it hard to see those beautiful snowflakes as free time and bliss. But, with some proper planning and today’s electronic connections, I can still get some real work done. It’s all about the planning. Lately, I’m often telling myself, “A wise woman once said, It’s Not About The Money!” You’d think I’d remember. 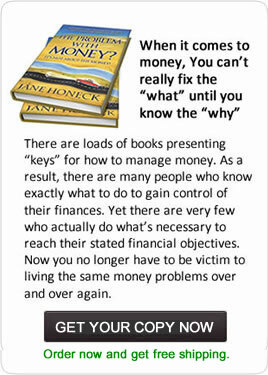 But when I’m in one of my stuck places and/or feeling emotional angst, I find myself blaming money. Here’s a good example. I took my middle son to buy dress clothes for my mother’s funeral. Of course, that’s not his favorite thing to wear (nor is shopping), so I wanted to keep the cost down. But, I soon found out that a size 52Long isn’t something you find easily at most stores, so we ended up at Men’s Wearhouse – not the cheapest place. The clerk was incredibly helpful even though I told him I needed to outfit Kilian “as cheaply as possible”. Suit jacket on sale for $109: yeah! Trousers not on sale: $90, oh, alright. Then, I asked for the cheapest shirt possible. He handed me one for $45. Okay, now it’s all too much. No, problem, “I’ll go somewhere else to find one on sale”. And, then he said, “you’re going to have a hard time finding one in his size”. One last shove over that emotional cliff! But, after I calmed myself down, I knew – it’s not about the money. Oh sure, I tried my hardest to make it all about the money. But when I stopped and let myself feel what it really was about, I knew money had nothing to do with it. So next time you find yourself emotionally stuck in money problems, take some time to feel what’s really going on. It may not be as obvious as my story, but I’ll bet you 9 times out of 10, the angst you’re feeling doesn’t have a thing to do with money – it’s just easier to go there. All is well. I bought the shirt; he looked wonderful. Case closed. I started this post last week but with the Holidays and life in general, I never got it finished. Reviewing it this morning it seems even more appropriate for this week. “Yesterday was the winter solstice, the longest day of the year. Here in New England that left us with less than 9 hours of sunlight! And on a dark, dreary, snowy day—that’s just not enough. I don’t even want to think about what it’s like where there is virtually no daylight at all. It’s important for me to remember that although it’s a dark, dreary, “short” day, we just made it through decreasing sunlight and are embarking on a period of increasing light. As far as I’m concerned, we’re definitely on the upside. Today the waiting ended and if I am to believe what I wrote last week, it is the start of something fresh and new. I received the call I’ve been waiting for; my mother died early this morning. Maybe this unfinished blog is my reminder that the torturous wait is over for me and my sisters; but more importantly for my mother. And, that no matter what we believe, this is some kind of beginning. So I’m going to believe that this new beginning is fresh and new. It’s back to my half full/half empty philosophy and seeing life through rose-colored glasses. Yet for me, believing anything else would just prolong the torture and I know that’s not what my mother or my life is about. Happy New Year and New Beginnings! I love you Mom.